One year for Christmas, my sister got an amazing gift. I was so jealous! I asked her if I could play with it, all the time. I snuck it out of her room to play with, when she was gone. I loved that toy, and wanted one for my very own. This coveted toy was a Doodle Bear. It seemed so amazing to me that you could draw on a teddy bear. Doodling little pictures and putting “makeup” on the Doodle Bear was so much fun. Unfortunately, my sister always noticed when I had doodled on her Doodle Bear, and then I was in trouble! The Original Doodle Bear is back and better than ever. 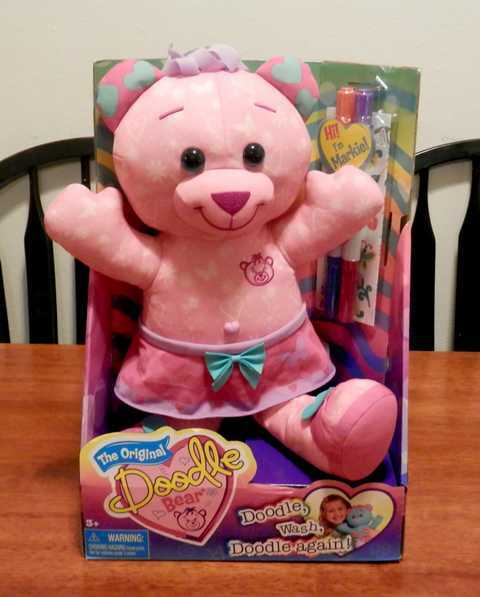 The Doodle Bear comes in three colors: pink, purple, and blue. Each Doodle Bear has a cute outfit and shoes. 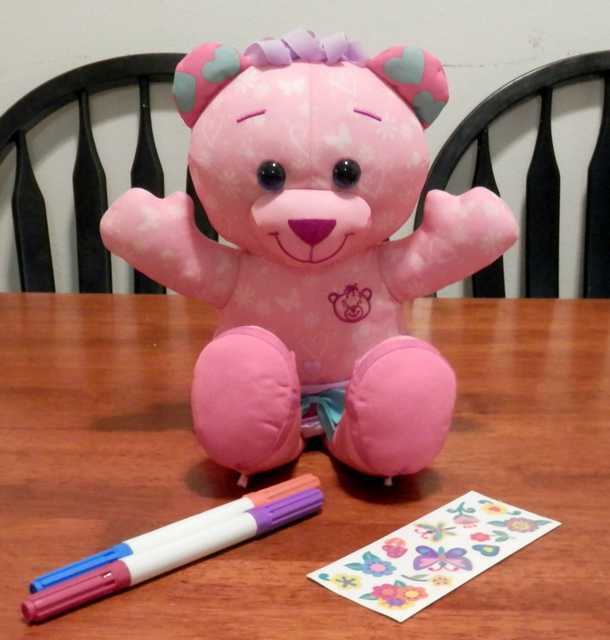 The Doodle Bear comes with two markers, two stamps, and a sheet of stickers. The body of the Doodle Bear is covered in hearts, butterflies, stars, and swirls. These designs are perfect for tracing with the markers, or your little artist can color and draw whatever they want. To clean the Doodle Bear, simply put it in a pillowcase and run it through a normal wash cycle. It is recommended that the Doodle Bear is washed, within 48 hours of coloring, to avoid staining. This holiday season you can also get the brand new Magic Glow Doodle Bear. 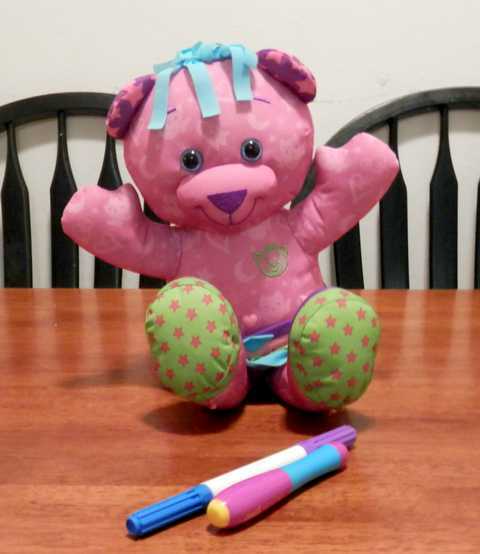 The Magic Glow Doodle Bear comes with one marker, one stamp, and a magic glow wand. You can draw and doodle on the Magic Glow Doodle Bear, just like on the Original Doodle Bear. If you are in the dark, you can use the magic glow wand and doodle on the front of the Magic Glow Doodle Bear. Make sure and press firmly! The magic glow wand requires 3 LR44 batteries (which ARE included). I couldn’t get a good picture of the glowing doodles, but as you draw, the magic glow wand causes the designs to glow bright green. The glowing doodles last for between 5-8 minutes. They then fade and you can begin to doodle again. To wash the Magic Glowing Doodle Bear, simply place the bear into a pillowcase and wash on a normal wash cycle. When I washed the Original Doodle Bear, the designs washed away without a trace. I washed the Magic Glow Doodle Bear two times, but the designs I had drawn were still faintly visible. I love that the Doodle Bear encourages creative play. It is not just another stuffed animal. Children can doodle, draw, and design all sorts of creations on the Doodle Bear’s unique fabric, and the new Magic Glowing Doodle Bear takes creativity to new heights. The Doodle Bear was given Creative Child Magazine’s 2014 Toy of the Year Award & The 2014 Creative Play of the Year Award. The Original Doodle Bear and the Magic Glow Doodle Bear were featured at the TTPM 2014 Holiday Showcase. You can find more amazing holiday toys on our Most Wanted Holiday Toys post. The Original Doodle Bear retails for $19.99. The Magic Glow Doodle Bear retails for $24.99. Both are available at Toys R US, Kmart, and Walmart nationwide. ILMK blog is giving away 1 Original Doodle Bear and 1 Glowing Magic Doodle Bear. That means there will be two winners!!! To win, you simply need to fill out at least one entry in the form! The giveaway will end on 10/25 at 12:00 am. The winners will be notified by email and have 24 hours to respond. Good luck! Congratulations to Barbara Riffe the winner of a Magic Glow Doodle Bear! 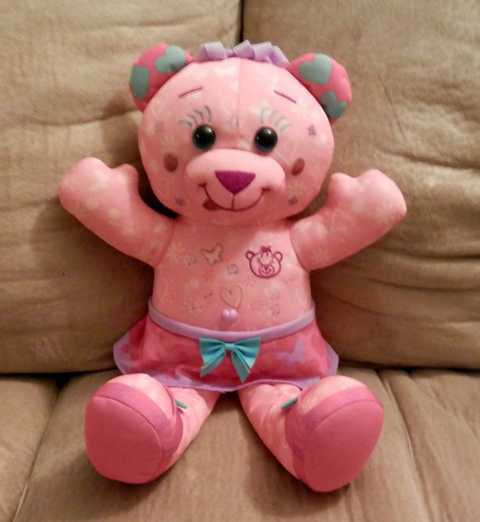 Congratulations to Dana Chavez, the winner of an Original Doodle Bear! Disclosure: I received items to facilitate my review. I was not required to give a positive review. All opinions are my own. 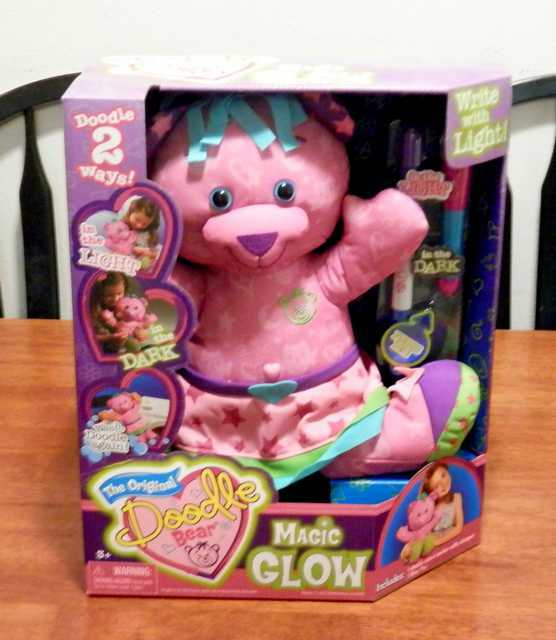 I know a beautiful little girl (my niece) who would love a Magic Glow Doodle Bear. What an awesome opportunity, thanks!! Ohhh, my granddaughter would LOVE the Doc McStuffins Get Better Talking Mobile! Anything and everything Doc McStuffins is and automatic hit here. I would love the puppy surprise plush for my daughter! Puppy Surprise Plush would be her favorite. My Niece Would Also Love The Puppy Surprise Plush This Holiday Season! My son would love Jake and the Neverland Pirates stuff! One of my daughters’ wants the Doc McStuffins Mobile, and my other daughter likes the Monster High Anti-Styling head! 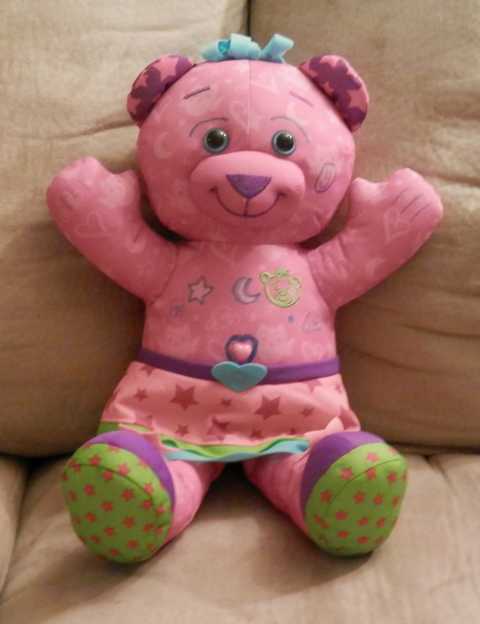 I believe my great niece would love the doodle bear..
My daughter would live the Monster High petti skirt or pet plushes. The mickey mouse clubhouse tools! My littles would love the Doc McStuffins Checkup Center! My daughter would love to get the Doc McStuffins doctor dress up kit. She would love any dress up kit really! The puppy surprise plush would be perfect for my daughter. My kids would love the Doc McStuffins Checkup Center AND the Doodle Bear. My kids would love the Doodle Bear.